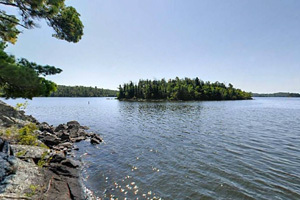 Welcome to the Lake Vermilion State Park virtual tour! 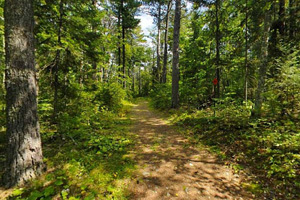 One of the newest state parks, Lake Vermilion-Soudan Underground Mine is located just south of the Superior National Forest and the Boundary Waters Canoe Area Wilderness. 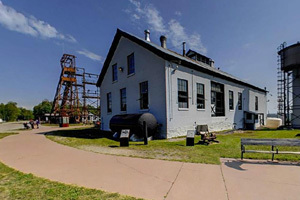 This virtual tour explores mining history and exciting underground tours tell the story of iron mines and mining communities. Explore the trails near wetlands, stunning overlooks, and beautiful shoreline. We hope it prompts you to visit the park in person sometime soon. Armstrong Bay is on the east end of the park. Across the bay (to the west) is the park's new day use area, complete with three picnic shelters, water, vault toilets, a boat dock, and a fishing pier. This tour showcases what the park looked like prior to the campground development in 2015, but you can expect continued additions and changes as construction continues. The park encompasses approximately 4,000 acres of stunning, rugged landscape. The park has ample shoreline and numerous rocky islands coated with lichens and studded with trees. A wide swath of water dotted with rocky islands meets the horizon at Cable Bay. The bay received its name from cables once used to assist lumbermen and miners with their work. If you look in the water you can still see the metal rings that secured these cables years ago. 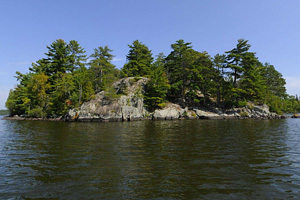 Most of the islands in Lake Vermilion are not part of the park. Some of the islands are state owned, some are private, and some are owned by the Bureau of Land Management. Maps are available showing which islands are acceptable for mooring a boat. 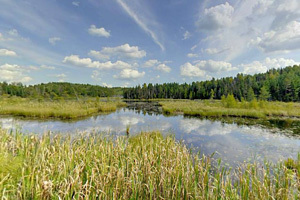 An incredible wetland complex was created here by a dam that sits level with the trail. If you walk along a nearby wooden bridge, you will get a better perspective of how immense the dam is. River otters have been spotted playing here in the winter. Until construction is complete, access to the trails is available on weekends near Armstrong Bay or every day from the Soudan Mine. 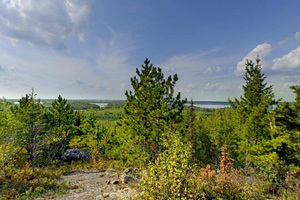 This side of this rocky overlook offers a stunning blue and green vista of Lake Vermilion and its many islands. The vegetation here is fragile, so please tread carefully. 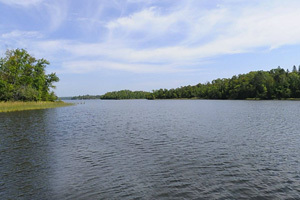 The park offers approximately 10 miles of stunning shoreline. The goal of the park management plan is to keep much of the shoreline looking as it does in this scene of Mattson Bay... lush and wild. 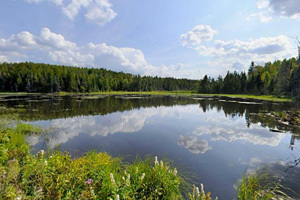 This beautiful lake, rimmed with evergreen trees, is easily accessed through the trail system. A nearby picnic table provides the perfect spot to eat a meal or rest. This is the start of the trail system between Soudan Underground Mine and the new campgrounds. Notice a difference in the forests as you hike the trail. 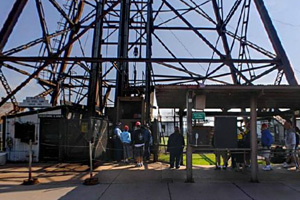 During the years of U.S. Steel ownership, the new section of the park was logged several times. This has resulted in younger, smaller trees. In contrast, Soudan Underground Mine section contains many old pines. From this trail you can access several other trails in the park. There were approximately 18 shafts on the property, but No. 8 was the deepest. Guided tours use the No. 8 shaft to access the underground. The shaft is set up with three compartments: east, west, and manway. 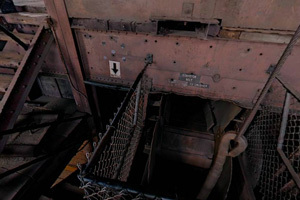 East and west compartments hold two sets of cages which once took miners to the different underground levels where they worked and now take visitors to level 27. The manway houses the utilities for the mine: electric wiring, compressed air pipes, etc. It also houses a ladder system that runs from the surface to the 27th level. Shaft Station is what the miners called the area where they got off the man cage and where the ore would be loaded into the ore skip and hauled to the surface. This is also where visitors load onto train cars and prepare to head down the drift (tunnel) to the stope during guided mine tours. The miner's lunchroom is located here. The train ride takes visitors to the 27th level stope. The miners would have walked this ¾ mile distance. 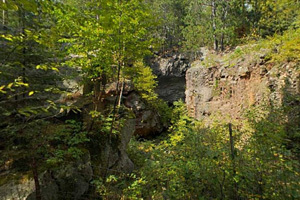 Once they arrived at the stope, the miners would have climbed the “manway” or ladder to reach the stope, which is about 30 feet above the drift. The entrance into the stope has been made easier by adding a 30 plus step spiral staircase. There is an elevator in this area for those who are not able to climb the spiral staircase. 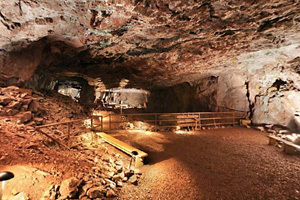 The stope is the area where the miners drilled and blasted the rock and then removed it from the mine. Nothing is needed to support the back (what miners called the ceiling). The pillars are left in the stope because they contain waste rock (lacking iron ore). After the rock was blasted, it was scraped down a hole in the floor, called a raise (see the wood crib and metal grate on the floor). 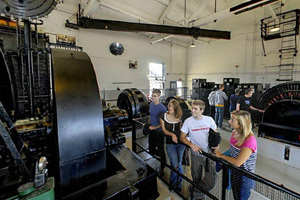 On your way to the visitor center, where the underground tours begin, you'll walk past the Engine House. You will also pass the sheave wheel, part of the equipment that helps move hoist cables. 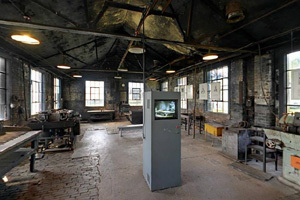 The Tower Pit, one of approximately thirteen mine pits in the park, sits to the north of this Engine House. The Engine House (and the hoisting system within) is a must see when you visit the park. The hoistman sits in front of the two large dials and controls the movement of the cages underground. Looking at the dials that read east and west, one can determine that the west cage is near the surface and the east cage is near level 27. The hoist has two cables that wind or unwind from a large drum. As one cable is unwound (the cage is lowered into the mine), the other side winds on the drum (the cage is brought to the surface). Guided mine tours begin in the visitor center. You may also explore displays with photographs, mining artifacts, and rock samples or find unique souvenirs in the Nature Store gift shop. Historically the visitor center was known as the Dry House, as this is where the miners prepared for work and cleaned up at the end of the day. The structure did not have the ceiling seen today, so miners would raise their wet clothes up into the rafters to dry-- hence the name Dry House. 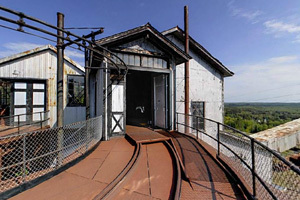 When ore reached the surface, it would follow the railroad tracks from the headframe to the Crusher House. The ore would then enter the Crusher House on one of the two rail routes seen in this view. Once in the Crusher House, the ore would be crushed into seven inch chunks and then sent onto the Trestle to be dumped into the awaiting train cars or onto the stock pile. You can access this side of the Crusher House from behind the visitor center. Ore came in one side of this Crusher House building and was dumped onto a conveyor that fed two jaw crushers. Look down and you'll see the opening of these jaws that once crushed ore from the mine into seven inch chunks. The Crusher House was the heartbeat of the community. As long as the community heard the crusher working, they knew there were no problems at the mine. The crusher operated year-round, but the building was not heated. Crusher operators had to warm up in the enclosed area by the stairs. During the winter, when Lake Superior was closed to boat traffic, the iron ore would be stored in the stock pile. This was located on the flat land beneath the Trestle. Railroad tracks would be extended past the end of the trestle as the stock pile grew. 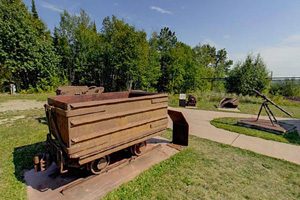 In the spring, the ore would be loaded by hydraulic shovels into train cars and shipped to Two Harbors. 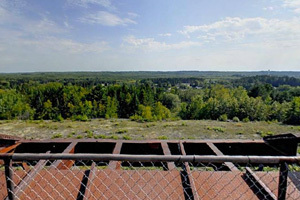 On a clear day you can see the mining operations in the towns of Virginia and Aurora from this overlook. After drilling rock underground, drill bits and drill steel needed to be repaired at the Drill Shop. Sharp drill bits were important, so miners picked up a fresh supply before heading underground. The type of rock drilled determined how quickly the bits were dulled. Banded iron was the hardest and caused drillers to go through many bits, while greenstone was softer. Though the floor of the Drill Shop looks as though it is made of bricks, you are actually seeing wood planks standing on end. 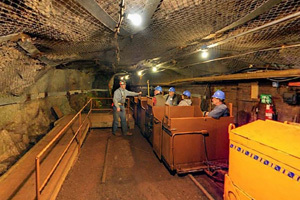 Here visitors can see the larger pieces of equipment needed to operate an underground mine. The equipment includes ore cars used to haul ore from the stope to the shaft station, so it could be transported to the surface. In the distance is a drill used to drill holes for blasting rock, as well as the tugger and scraper which helped move rock around the stope. 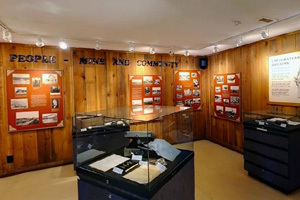 Visitors can also read about the National Historic Landmark status that the park received in the 1960s. Located just off the northwestern end of the parking lot, a 0.2 mile wooded hike takes visitors past the deepest mine pit on the property. 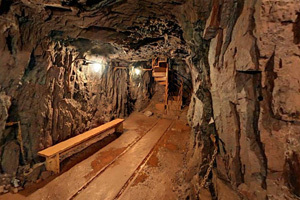 Upon seeing the pit, one might gain a better appreciation for the work of early miners and understand why it was safer to mine underground than in open pits. If you visit in the summer, be sure to look for snow in the pit, as it sticks around well into June. The Breitung Pit is where iron ore for the first railroad shipment was mined. The ore was stockpiled until the railroad was completed in 1884. On July 31, 1884, the first shipment of ore left Soudan bound for Two Harbors. 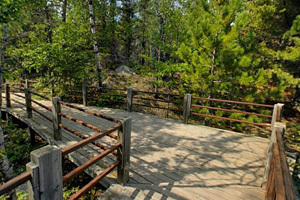 There are over 5 miles of trails in the park, including the 2.5 mile Hiking Club Trail Loop. 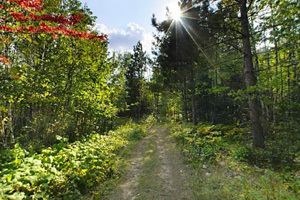 Trails go through old growth pine stands and a variety of mixed forest habitats. Look for signs of wolves, bears, and deer along the trails, as they are present in the forest. 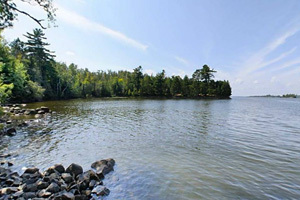 The Stuntz Bay Boat Access is one of the many access points to beautiful Lake Vermilion. There are over 140 historic boat houses that line the shore here in Stuntz Bay. The boathouses are wet storage areas for boats and were constructed by many of the former miners at Soudan. The area received National Historic District status in 2007. The tall chimney in the image is the chimney from the compressor house. 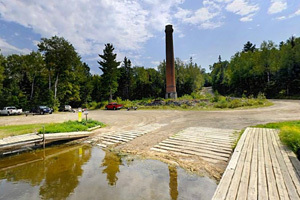 It was built in 1887 and it pulled water from Lake Vermilion to make steam power. This steam power ran equipment that created the compressed air which was piped up the hill to the mine facilities. The Soudan Iron Formation is a mecca for geologists throughout the United States. Observant visitors will notice unique patterns in the rock here. 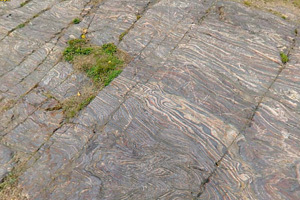 There are many theories as to the creation of this local “swirly rock,” but the most common involves the ebb and flow of bacteria dying in ancient oceans.